Electronic punch system features Guide Right paper alignment for accurate punching every time to avoid mispunched sheets. Front and side guides ensure paper is aligned before punching. The CombBind C210e is compatible with regular and oversized covers and ideal for large offers with punch capacity of 20 letter-size sheets and a binding capacity of 330 sheets. Punch documents with the simple push of a button. 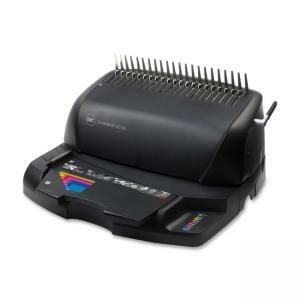 $116Fellowes Star+ 150 Manual Comb Binding Machine - Manual - CombBind - 150 Sheet(s) Bind - 12 Punch - A4 - 3.1" x 17.7" x 9.8"
$345Swingline Proclick Guide Right Manual Punch System - Manual - ProClick, CombBind - 110 Sheet(s) Bind - 15 Punch - Letter - 10\"
$205Swingline Velobind V100E Electric System - Electrical - Strip - 200 Sheet(s) Bind - 24 Punch - Letter - 8.4\" x 12.2\" x 20.3\"